The Eternal are probably my favorite monster of Spears of the Dawn and the major antagonists of the setting. When their evil kingdom was facing defeat by the five other realms of the Three Lands, they turned to dark magic to make themselves immortal. After their death, a magic ritual made their bodies return to a state of unlife, where they need to neither eat, drink, sleep, or even breath. Nor do they bleed and they are impossibly to truly destroy. Stabbing wounds don’t harm them at all and the only way to really harm them is to break their bones or chop off their limbs. While they are able to exist deep in the deserts or underground without any food or water forever and can not be killed by weapons, their unliving nature also makes them unable to heal as they are still corpses. The only way to restore their mangled bodies after suffering the effects of injuries, blasting sand, and the blazing sun is to feed on human flesh. And that already tells you pretty much everything you need to know to understand why they are such a terrifying menace on the Three Lands. They are a lot like vampires in many ways, but also distinctively different creatures. They do not have to feed on humans, but if they do not the ravages of time and the environment quickly take a heavy toll on their dead flesh. They are not harmed by sunlight and in fact nothing can really destroy them. The only way to deal with them permanently is to decapitate them so they are unable to feed and heal their injuries, but even when burned to ash and their bones are ground to dust, their immortal spirits remain, unable to gain a new body or truly die. And like vampires, many eternal sorcerers know the old rituals and can raise the corpses of their enemies to be their slaves forever. 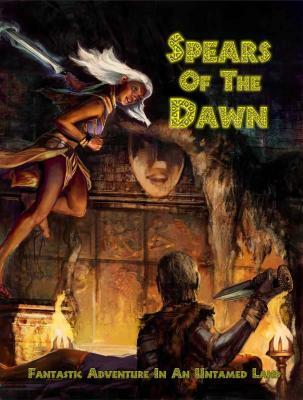 Spears of the Dawn is an interesting setting in itself, but the Eternal are what really is selling it to me. They are somewhat similar to an idea I had for my Ancient Lands settings, and I got a whole number of new ideas I want to include from the Eternal. Old friend, we meet again! The Fanged Ape is Spears of the Dawns version of the Evil Ape. The stats of fanged apes are just like those of any other big apes you’ll come across with no special ability whatsoever other than being as smart as people. But Crawford managed to given even these generic brutes a bit of a new interesting twist by describing them as sometimes raiding human villages in the night to steal children in their sleep to eat. That’s already a lot more sinister. One group lives in the mountains and likes to ambush human hunters and warriors with rockfalls. A great example of how a good monster really isn’t about looks or abilities, but it’s almost entirely their behavior that makes them interesting and frightening. Remember the apes from Princess Mononoke? These guys could easily be portrayed as just as creepy, without the sympathy for their plight. Ghosts of the Three Lands are mostly like you’re used to from any other settings. They are the restless souls of the dead who linger on as incorporeal spirits. While they are not exceptionally strong, they are difficult to hit even with magical weapons and their touch drains the life force from the living who dare get too close to them. But there are a few new ideas for them too. 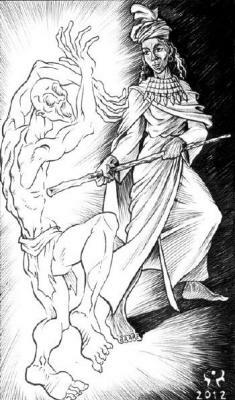 Destroying a ghost is relatively easy if you can hit it and avoid its touch, as simply dealing enough damage with magic weapons and spells will force them to depart to their afterlife. Ghost always haunt the place of their death and never move far away from it, but most disappear after sunrise and only returning at nightfall. However, there are many exceptions to that rule and some ghost can fight even in the sunlight, take possession of corpses, or even make their own bodies out of earth or wood to attack any who draw their rage. 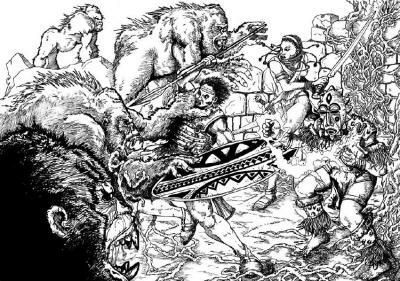 The Giants of the Three Lands look very much like large humans with perfectly black skin, but are believe to be in fact immortal spirit who were each created by the gods at the dawn of the world. They are all highly cultured and wear rich clothes and jewelry and each one of them is a great warrior and craftsman. Since they are few in number and become fewer with every one that is slain, most giants are solitary, but many have large numbers of human servants and slaves. They are believed to be the first children of the gods and most despise humans for being both so much weaker and still being favored by the gods. 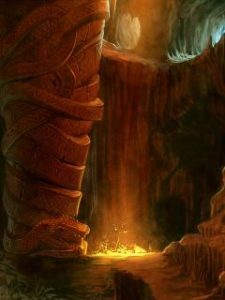 The houses of these giants are often dangerous mazes full of traps to kill human intruders, and even if the giant is dead, its home can hold many wonderous treasures that are not found for many generations. 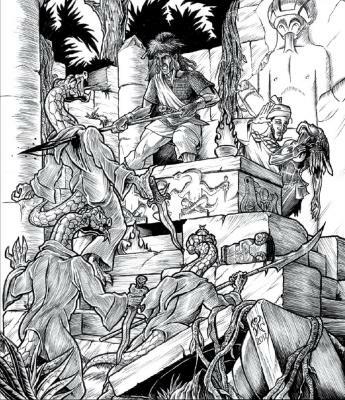 An Ilomba is a spirit that serves the gods of the underworld and has the form of a snake. They seek out witches or priests to become their assistants in leading worshipers of the underworld gods and offer them many magical gifts. When bound together, both the ilomba and its master are invulnerable to normal weapons, but if one of them dies, they both die. The master also gains the magical powers of a low-level sorcerer. In turn, the ilomba gains the ability to perfectly assume the appearance and voice of its master, which allows him to seemingly be in two places at once and decieve any who might spy on him to discover the leader of the cult. While this all sounds pretty nice for the master, I also notice that this doesn’t mean that he is really in charge. He has no real power over the ilomba and the snake can just as well impersonate him before his own followers or deliberately leave hints of his involvment with any crimes it wants to blame on him. 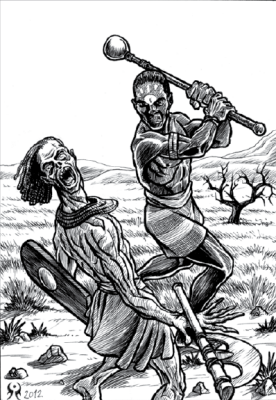 The bond between master and ilomba can only be severed by the ilomba and if the master would try to kill the snake he would also die himself. Since the ilomba is a devious evil spirit from the underworld itself, I can’t really see how anyone making a deal with it wouldn’t get screwed over in the end. This creature is less than a quarter of a page and only five sentences of description, yet it’s one of the most intriguing monsters I’ve come across in all the many monster books I’ve read. The Kishi is another malevolent spirit who appears as a very handsome young human man with a rich mane of hair. However, it has two faces and when it attacks it turns its head around to reveal the face of a hyena on the other side and strikes with its long fangs. Looking just at the stats, it doesn’t have any special abilities. It either attacks with a weapon when posing as a human, or with its fangs. The only difference is the amount of damage it deals. However, a kishi always tries to disguise its true nature until right before it attacks to eat an unsuspecting human it manages to catch alone. They often appear like lone but charming travelers who seem like pleasant company on the road, or present themselves as young noblemen from distant lands or exotic entertainers. But no matter their disguise, their real goal is always to separate people from a crowd to devour them. Kishi are a lot like werewolves but instead of turning into a beast at night and being regular people at day, they are always on the hunt and actually much more dangerous as they are able to lure their victims into traps. Again, just a quarter of a page of stats and description, but a great setup for an adventure or even a mini campaign. Werewolf stories will be familiar to all players, but when the monster is actually fully in control of itself at all time, things get shaken up quite a lot. People disappearing and bloody remains being found in dark corners could be almost anything and a charming young men who mingles with the rich and beautiful might quite likely the last person the players would suspect. Leopard Cultists are shapechangers very similar to werewolves and are humans who can transform into leopards to prey on other people. But unlike werewolves, leopard cultists are not the result of a curse or disease, but actually worshippers of leopards and their strength who love turning into a beast and welcome it. They are almost never alone and can appear in quite large groups and are always on the hunt for human prey as sacrifices for their beast gods. 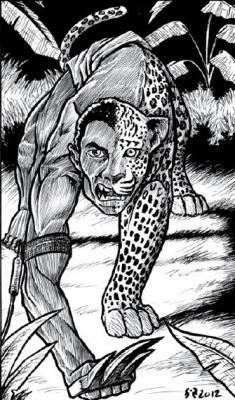 Simple cultists are merely somewhat mad humans who dress as leopards to hunt for other people in the night with claw-like knives, but the true initiates can turn into real leopards. This is an adventure that writes itself. First a village appears to have a growing problem with leopards and ask adventurers for help, who then discover that it’s really a mad cult who hunt people in animal disguise and sacrifices. But just when it seems the situation is about to get under control, another big twist reveals that some of them are not just mad but can actually become leopards. This makes the old generic European werewolf look rather bland and boring by comparison. The Rompo is a large beast that looks like a huge starved rodent and feeds on human corpses. Like ghouls, they often make their lairs in old tombs or cemetaries, feeding on the remains of those burried there and slaying any travelers or explorers that come to store their bodies to be eaten later. When investigating the disappearance of people near an old tomb, there is a good chance of finding the rompos food stores before encountering the beast itself. Rompos are very smart and while they don’t speak human languages, they sometimes gather in large groups on graveyeards. The howling of a group of rompo at night has a hypnotic effect on any humans nearby, which makes them especially dangerous. The Sasabonsam are a race of winged men with red hair who often abduct people by snatching them up into the air and carrying them to their dark temples as sacrifices to their bat gods. 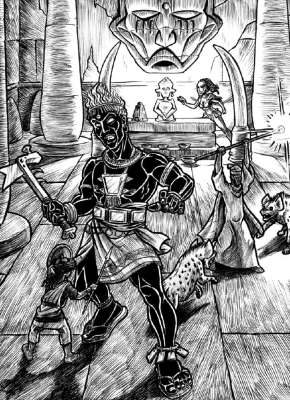 Few people have ever seen these lairs of the sasabonsam and returned to tell of them, but often these creatures are led by an evil sorcerer or a moatia. Seems to me like a lot of monsters in the Three Lands like to abduct people and carry them to a hidden lair. I wonder if that is a common theme in West African myth. 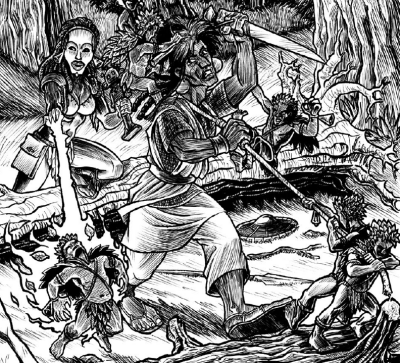 Can’t really have a desert heroic fantasy setting without snakemen, do you? Umthali fulfill this role in the Three Lands. They are the distant descendants of humans and intelligent snakes from the early days of the world and serve the dark gods of the underworld but were driven out by the gods and their human followers. Normal umthali warriors are not special in any way, having basically the same abilities like humans. They are lead by very powerful shamans, though. 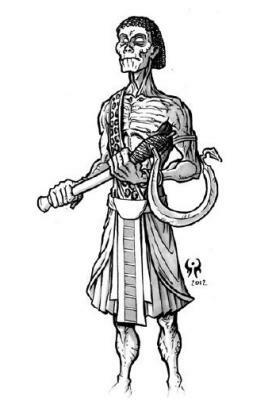 Like the yuan-ti from Dungeons & Dragons, umthali have many different shapes with some of them appearing almost human, While the serpentmen of Robert Howard had the ability to change their shape to that of specific humans, these creatures here seem to be straight copies of the Yuan-ti. I would have loved to see some new ideas for them, especially given the strength of many other creatures of the setting. A Walking Corpse is in many ways like a zombie, but it’s merely dead and not a rotting husk of a man. Shamans can create them, but only from bodies that have not been burried yet, as the souls of these have already departed into the afterlife. When a walking corpse is destroyed, its spirit still survives and lingers on, but the book doesn’t say what would become of them. Witches are people with a natural ability of sorcery. They can curse others simply through the force of their will and it might take many years until their powers are revealed even to themselves. Often witches of a given area come together and meet in their dreams, and the leaders of these groups are often very powerful sorcerers. Many witches are not evil, but their powers only allow them bring harm upon others and can’t be used to do any good other than hurting those who threaten their villages and families. These magic abilities can be removed by spells that can break powerful curses, but only if the witch truly desires to do be rid of the powers. Otherwise they quickly return. I am really surprised at how much great stuff is here on so very few pages. It’s almost two great monsters on every single page. Even really great monster books don’t come anywhere near to this. The monsters are also all really extremely minimalistic in their mechanics. With the rules being one of the many B/X clones, the stat block consist only of nine numbers and the description is just the appearance of the creature and a brief summary of what it does with almost no word spend on any specific rules as they are so straightforward that they don’t really need any more elaboration. Probably one of my favorite monster collections I’ve read so far.